Cold, windy, rainy and fantastic. Elevation Profile About 2000 ft. above sea level. Flat with some elevation gain approaching mile 15. Water Stations Sufficient water and Gatorade stations. Several GU stations as well. Highlights Running down the Strip and through part of Downtown (Glitter Gulch). Other Events 5K, 10K and a half marathon. This is a night race starting at 4:30pm. It is best for those who can run the 26.2 miles in under 4 hours. The time limit is 5 hours from the release of the last corral, but services begin to close up after about 4 hours after the start of the race. 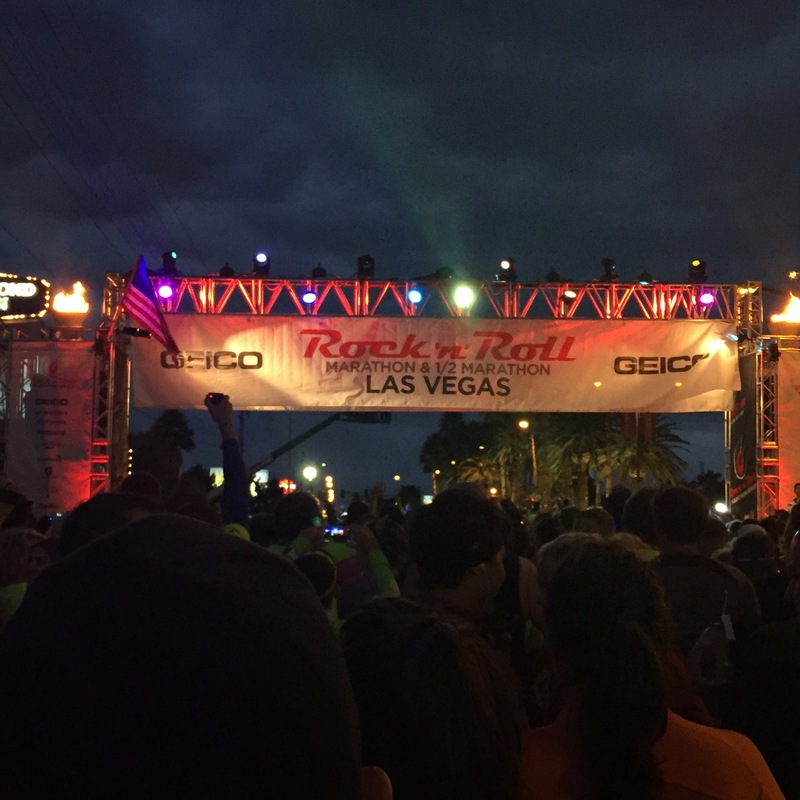 THE COURSE: The course begins at the south end of Las Vegas Boulevard (The Strip) by the Mandalay Bay Hotel and Casino and proceeds about a mile south and then loops back for a long straight run north up the Strip to Downtown Las Vegas. Once downtown, a few miles are eaten up serpentining of the streets leading up to a left turn at 8th and Fremont Street. 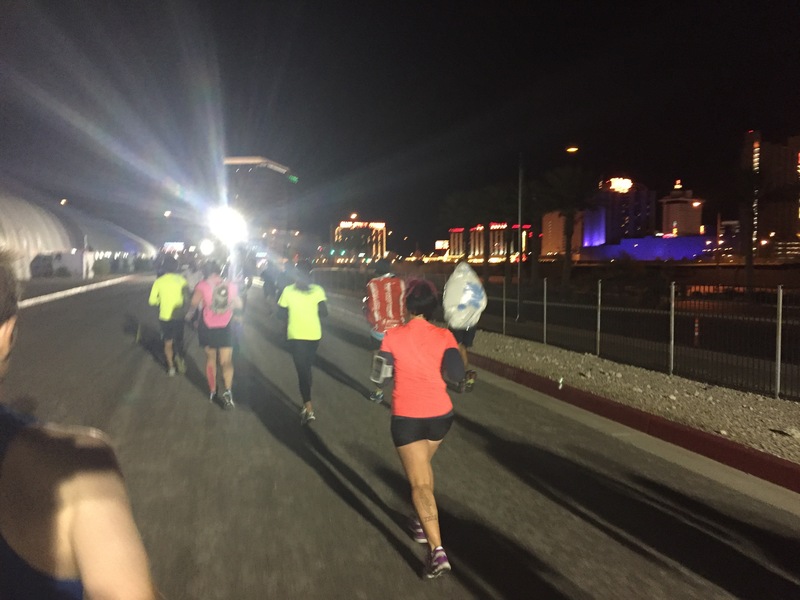 With a short run towards (but not in) Glitter Gulch, the course makes a left turn back onto Las Vegas Boulevard and start to head south again towards the Strip. A short while after this turn, the half-marathoners continue their way back to the Strip and the marathoners makes a right turn for a 13 mile extended adventure. Marathoners run past the jail and through a festive little industrial complex on to Martin Luther King Boulevard. Martin Luther King Boulevard brings a long 5 miles stretch slightly uphill. That leg seemed harder than it was because in the dark, I couldn’t tell how far it was until the turnaround, so there was this constant “are we there yet?” thing going in my head. 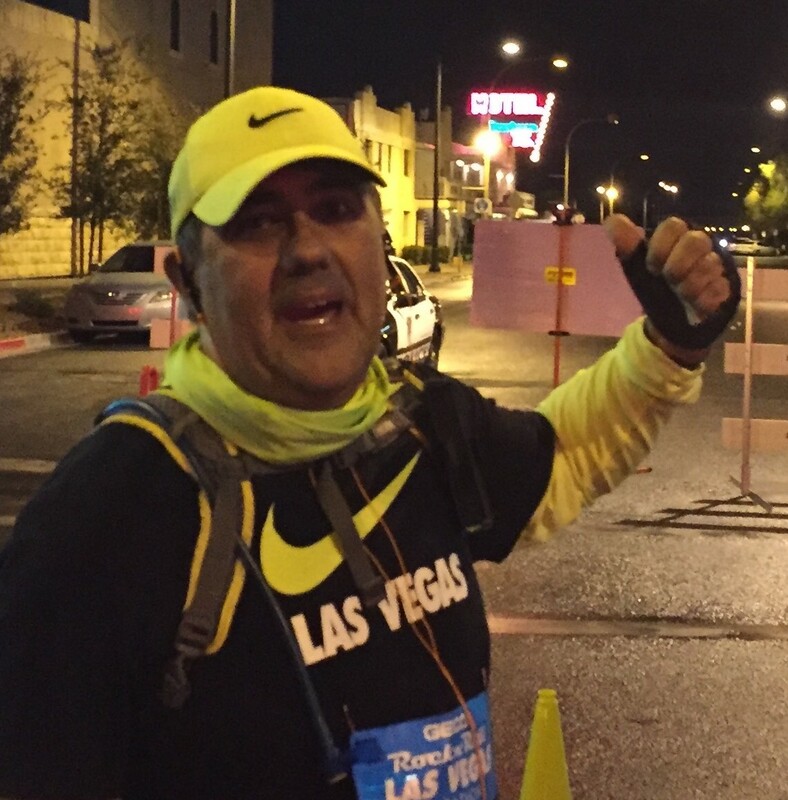 The course doubles back on itself after the turn around at mile 15 then adds a mile or so up a side street, but after that it’s a pretty straight and easy shot back to and through Downtown Las Vegas and up to the Strip. Mile 25 seemed to take forever, but all in all the this race goes very quickly (for a marathon). ELEVATION PROFILE: Las Vegas is about 2,000 ft above sea level. If you play tennis in Vegas you will notice that the ball flies a lot more than it does at sea level because the air is slightly thinner. 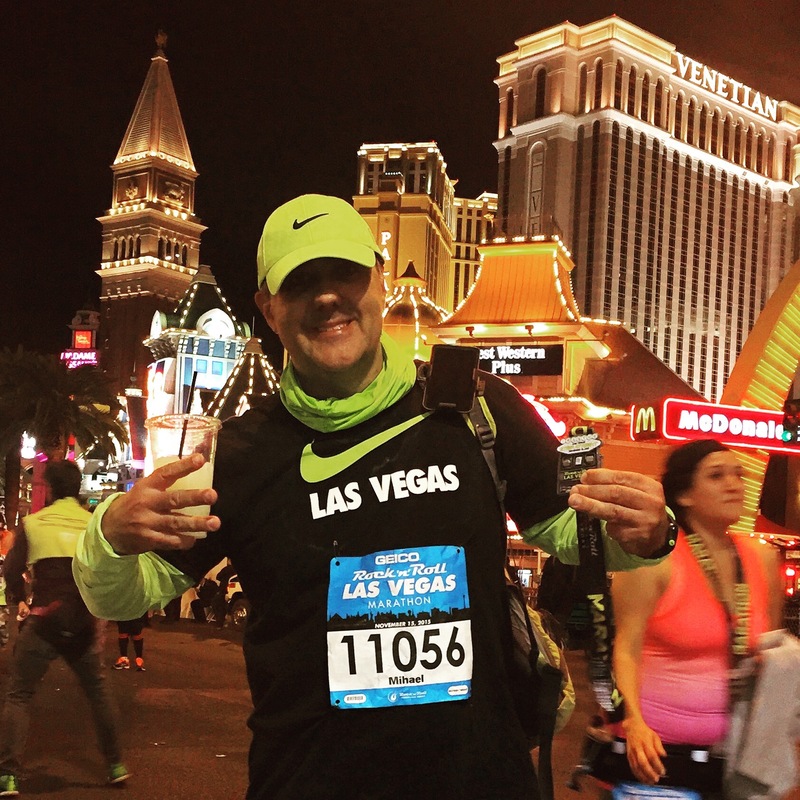 As an asthmatic, the Vegas air has never been a problem while running. The race starts at about 2,200 feet and is mostly flat. The elevation profile graph makes it seem that the race is dowhill at first, but that’s an artifact of the small scale of the Y-Axis on the graph. After the first mile, the next 9 miles are downhill at an imperceptible -0.45% grade. The climb that follows to mile 15 has an unremarkable +0.38% grade. The last mile up to the summit of the race is a 1.3% grade; nothing too daunting, but the cold dark and 15 miles behind me did made it seem worse than it was. After Mile 15, there is a short hill to climb off a side street, but it all feels flat after that. THE WEATHER: The Southern Nevada desert in November at night, is cold. The sun set about a half hour into the race, but the course was generally well-lit. It was not necessary to carry any additional lighting. The weather was supposed to be clear and about 65°F at the start of the race, dropping down to the mid-forties through the fifth hour of the race. A storm moved in early in the race. The average wind speeds were 19 mph with maximum gusts of 40 mph at times. There was a barely perceptible rain at first, then it became a bit heavier and then stopped. It was enough to wet the course for about an hour and my feet for the duration of the race. RACE ORGANIZATION: The race was well done from beginning to end. The Expo is held at the Las Vegas Convention Center and parking was free. Bib pickup was easy, there was lots of merchandise available for purchase. There were about 40 corrals, each one was relatively small. They were the width of one side of the street and about 20 people deep. The corrals seemed to be released about a 90 seconds to two minutes apart. The early miles of the race were crowded and slow. 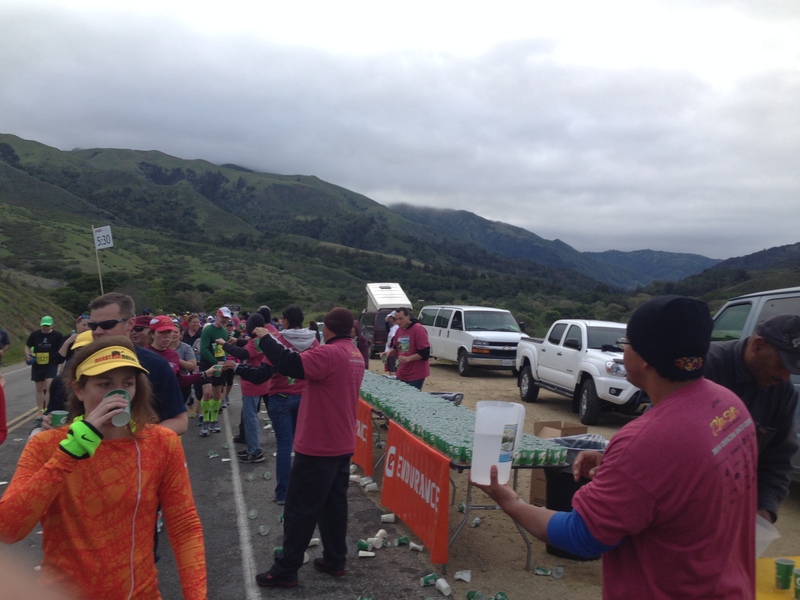 There were plenty of water stations and a few with gels. Those stations started to tear down about 4+ hours after the start of the race. By the time I was making my final miles, there were all shut down and the huge water containers were being drained in the street. There were medical personnel running among the crowd and there was a good police presence, especially in North Las Vegas. My finish time did not post initially. With a visit to the race website and a click of a few links, I notified the organizers and my time was posted within 6 hours. MY EXPERIENCE: Truth be told, 8 of the worst 10 things that have happened to me in my life occurred while growing up in Las Vegas. Other than the mountains the deserts and a few friends from High School, Las Vegas is not a place I hold in great fondness. Still, for the early bird registration fee of $99, I was willing to take a go at this race. I started training for this race the morning of my 50th birthday back in July. I knew I was going to have to pick up my pace some to complete the race under the 5 hour limit. After looking through the race finish times for the year prior, it became clear that there were a number of runners who finished in longer than 5 hours, so I quit stressing about it, but continued to work on speed. Laura and I drove into town on Saturday morning. 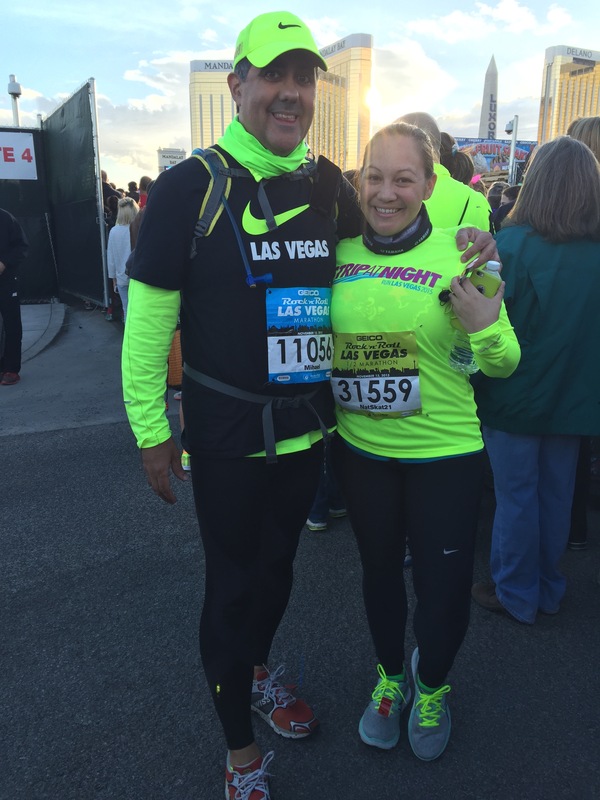 We hooked up with Natalie (from the Disneyland half and the Edinburgh half ) at the Las Vegas Convention Center for Bib pickup. Laura and I then went to a celebration of the life of a high school classmate who recently passed away. I saw old friends I hadn’t seen since high school graduation, which ironically, was the last time I was at the Las Vegas Convention Center prior that day. That service grounded me in where I came from and put me in touch with some of the struggles my fellow classmates went through. It was a little strange, a little awkward at times, but I was among good, caring people. The Sunday (race day) was a bit of odd situation. What does one do on a marathon day that begins at 4:30pm? I loaded up the car with friends and family, we had breakfast at 9am. We then took a drive out to the beautiful Red Rock Canyon. We cruised through the park only stopping twice so as not to tire ourselves out before the race. We then made our way to New York Pizza and Pasta to pick up pre-race meals. About 3pm, Laura dropped Natalie and I off near the start line and we made our way to our respective corrals. The half marathoners and the full marathoners are intermingled. The corrals were cozy, but I have been more densely packed corrals in other races. About mile 3 the crowd thinned out enough to get a full stride safely. Then it became a matter of getting by the half-marathon walkers and the crowds of married-at-the-start-line couples and their wedding parties. Remarkable on this run down the Strip was the Paris Hotel. 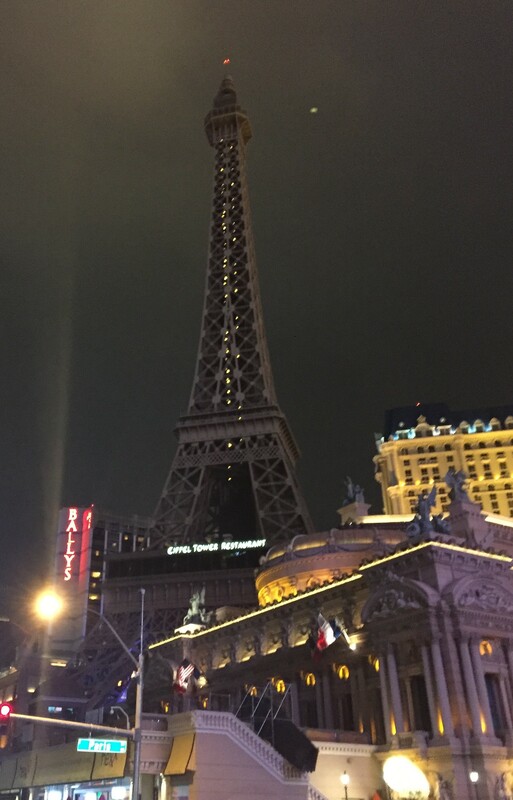 The lights on the Eiffel Tower were dark in respect for the recent terror attack in France. As I made my way south down the Strip, I remembered my mom and I walking down this same street back in 1974 on an early November Sunday morning. I tried to remember where the hotels of my childhood and teenage years used to be, the Sands, the Dunes, the Thunderbird, the Stardust, and the latest to go, the Sahara. The Sahara used to have a digit clock on top you could see for miles, that world is gone now. 8th Avenue near the Downtowner. As the race proceeded across Sahara Avenue, near where I grew up, I remembered learning to drive down these streets back in 1980. Lots of memories came back. Then as we made our way down into Downtown, I realized we were getting closer and closer to a dark place from my childhood, then all of a sudden there were on 8th Avenue near Ogden, in sight of what used to be called the Downtowner Motel, now the Downtowner Apartments. When mom and I came to Vegas in the early 70’s lived for several months in a 200 square foot room at the Downtowner. My mom would work one shift at the Downtowner front desk after working all morning as a maid in the motel across the street. I pretty much stayed in that hotel watching Richard Dawson, Bob Eubanks, Merv Griffin and Monty Hall all day. I remembered at the age of 9, figuring out how to make Campbell’s Chicken Noodle Soup on a hot plate for lunch. I stopped for a moment to look at old place and I flipped it off. I have escaped that life. A few selfies later, I was off and back down a world where I used to hang out at way too young an age. A bit down the road was the El Cortez Hotel a place that holds nothing but good memories for me. My mom and I used to go there for breakfast when we had money and I would eat silver dollar pancakes. The first time I took my family there back in 2006, they had just taken the silver dollars off the menu, but they made them for us. That was a good day. At the point where the course split I was happy to be away from the half-marathoners, but I also knew what part of town I was in. As I ran by the Clark County Jail, I looked at the tall dark, foreboding building that at different times had housed both my step-father and my mother. You never forget the sight of your mother being taken away to jail in handcuffs, but as I had 16 of miles ahead of me, I decided it was better to leave those weighty memories right there in that spot. Interestingly, I didn’t even notice the jail on the run back towards the Strip. 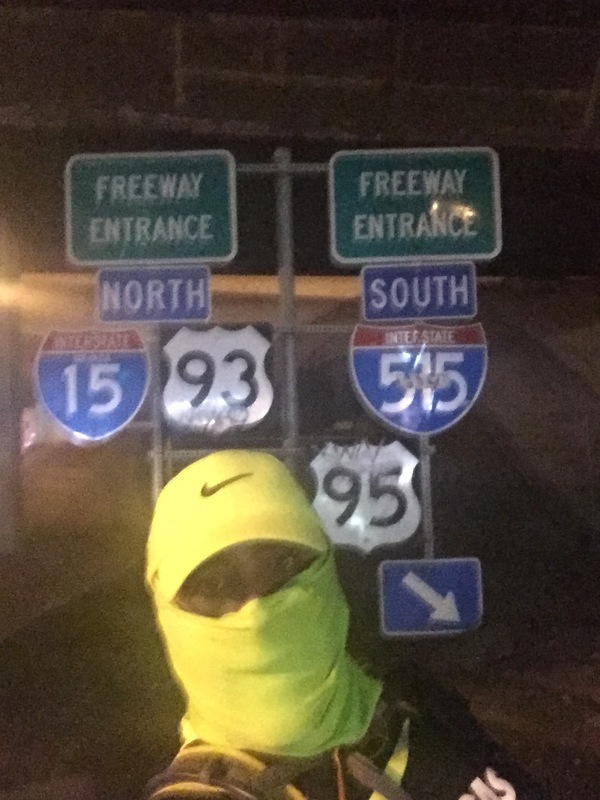 Mile 11 brought me to Martin Luther King Boulevard and a doozy of a headwind. Laura had made me a windscarf for my face at the last-minute before we left for Vegas. I was very grateful that she did. One of the things that I have started doing during recent races is taking the time to thank the police officers along the route for their service to the community. I started getting a little more specific in my thanks. In this race, I thanked them for their weekends away from their families and every holiday they have had to miss. I thanked them for every drunk and every nasty person and every domestic situation they have to walk into. The officers of Metro were appreciative of this thanks. As I got further into North Las Vegas I wanted to dig further emotionally and thanked the Metro officers for those occasions when they walked into my domestic situations when mom and I were dealing with a PCP/Jack Daniels-enhanced stepfather and they very professionally took him away… for a few days. Never underestimate the value of a few days respite in the middle of a nightmare. When I finally made that turn around at mile 15, I was taken aback by how far the Stratosphere Casino seemed from where we were, given that the finish line was on the far side of that hotel. The truth was we were only about 6 miles directly away, but with the night sky, the large structure seemed 20 or more miles away. The run back after the turnaround was relatively easy as marathons go. It was slightly downhill and the wind was at my back. The water stations, however were being taken down. I wasn’t too worried about this as I was carrying a hydration pack. Because of the high winds, the race organizers took down all but one of the mile markers. That made it slightly more difficult, especially at mile 24 my brand new Garmin died. I knew there were only a few miles left, so it was all good. I made my way across up Las Vegas Boulevard, across Sahara Avenue, down past Circus Circus (another infamous place in my childhood psyche) and on towards Caeser’s. About Mile 25, I heard Laura calling my name. She was there with Natalie and they had purchased a margarita for me to consume during my last mile. I did. In the last quarter-mile of the race, right on cue, the song Home Means Nevada came on my iPod. Being a child of Nevada (among other places) The State song was one of those things we learned as children, like the Pledge of Allegiance, or the Our Father (if you attended St. Christopher’s Middle School). I added this song to my playlist for this race just as a reminder of those good memories about this place. It’s the place of a thousand thrills. Home means the sage and the pine. With perfect timing, the song finished as I danced over the finish line. After I received my medal, I had one last thank you for a Metro officer at the finish line. I thanked him for being there and I thanked Metro for being there at some dangerous times in my life. #6 in the Books. I won. For the first time, after a race, I got down on my knees and thanked God for the blessing he has given me in this life. I thanked him for the day and for the people who were in it. I thanked him for giving me the opportunity to run this race and overcome the past. I finished my margarita and made my way from the lights of the strip, towards my family and friends. People who run marathons, and people who do not. 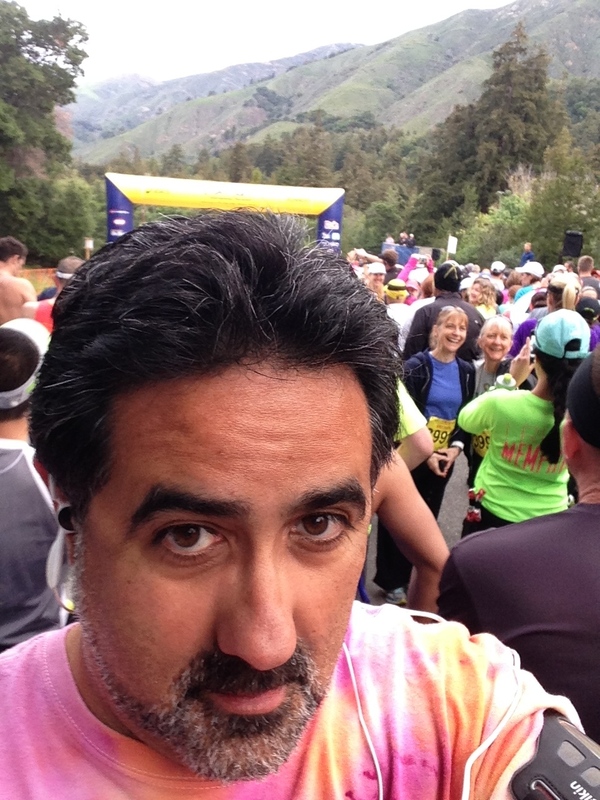 Prior to the Big Sur Marathon, a series of injuries left me with little faith in my abilities to run 26.2 miles. I tested my body a few weeks before the race and my body unambiguously demonstrated its lack of readiness. The smart thing to do would have been to skip the race. The problem with giving up before you start, “in the name of being smart” is that it creates a slippery slope wherein one can become so smart as to never do anything ever again. Better to fail than be too smart to start; far better to fail than live afraid of failing. As beautiful as God made this race course, he also made it brutally difficult with a series of small hills that go on and on and on. 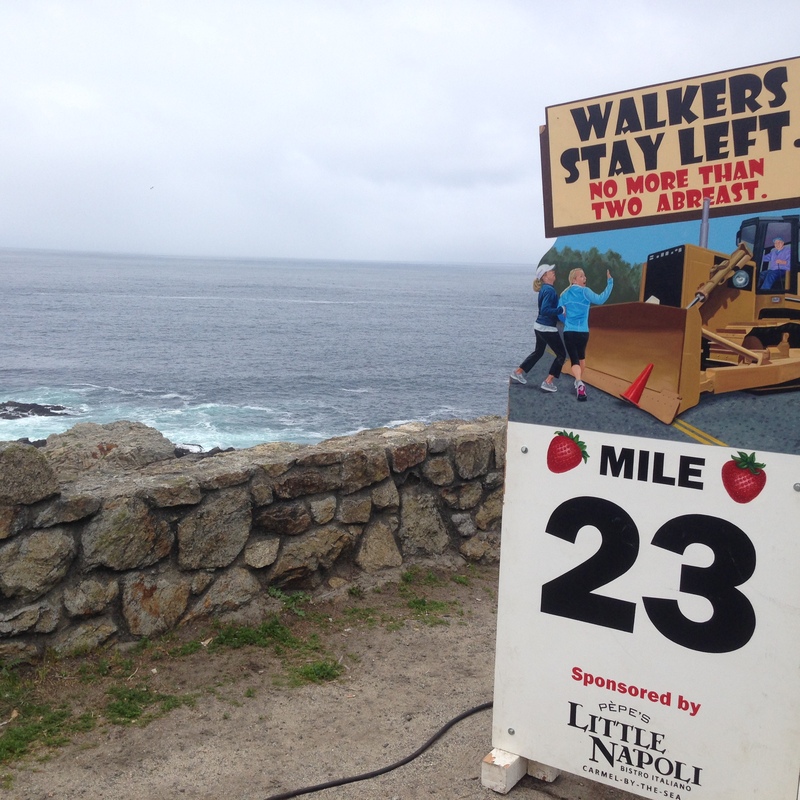 There were a total of 2200 feet of climb throughout the 26.2 mile course. That’s about 1 foot of climb for every word in this blog post. About 500 feet of that climb came in a single unrelenting 2 mile stretch. The man sitting next to me on the flight up the California coast was going to Monterey to golf. As we chatted, I explained that most of the flight was filled with svelte athletes who had run the Boston Marathon just days before as part of a coast to coast challenge. When the guy realized I was running the race as well, he looked me the eye and said, “You’re a runner? You don’t look like a runner. THEY look like runners“. I smiled and kept my response to myself. I hailed a cab to my hotel and held up there until it was time for bed. At the appointed hour of 2:45 in the blessed am, my sister called me from England to find me already up and hydrating. I sat in a hot bath for about 30 minutes as I had all week in hopes of getting my calves loose. By 3:45am I was on a shuttle bus to Big Sur. The race staging area was dark, chilly and crowded. It was all rustic without basic creature comforts like cell service. 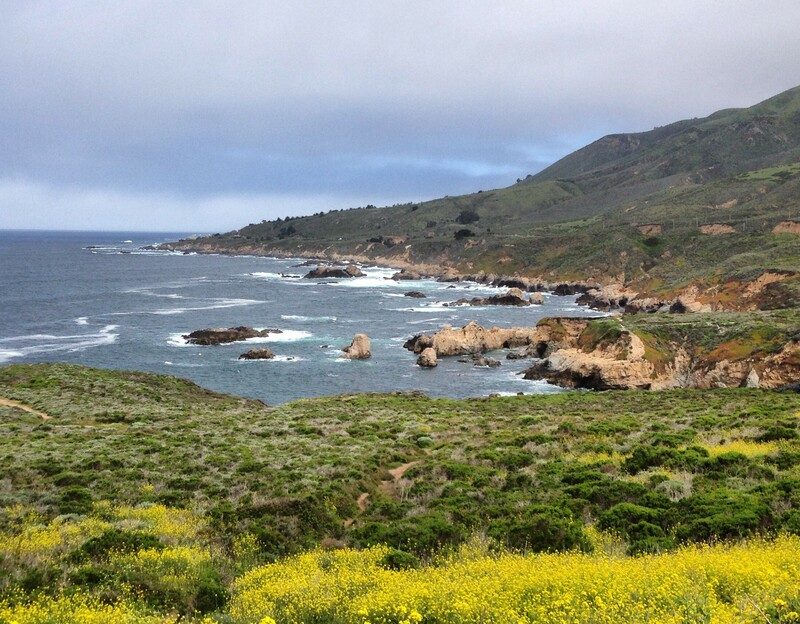 I socialized with the other runners but after a while, I pulled out my copy of Kerouac and started to read, if only for the bohemian novelty of reading Big Sur in Big Sur. I looked up at the early morning sky and tried to filter out all the noise of the generators and the runners in hopes of just feeling the native energy of these dark woods. I got nothing. Either they weren’t transmitting or the noise inside me was too loud. Eventually, I packed everything away, checked my bag and made my way out onto the starting line on California’s Highway 1. 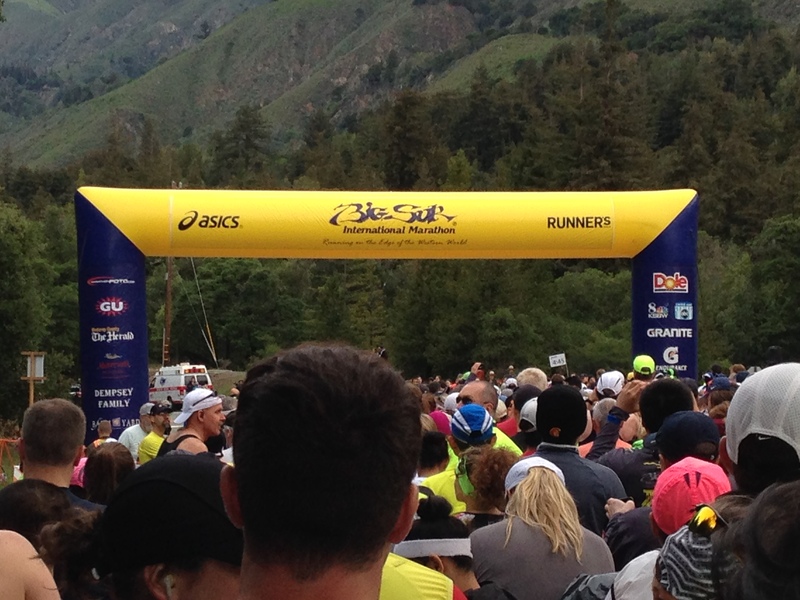 I stood near the back of the crowd of 4,000 runners, filled with both anticipation and dread. 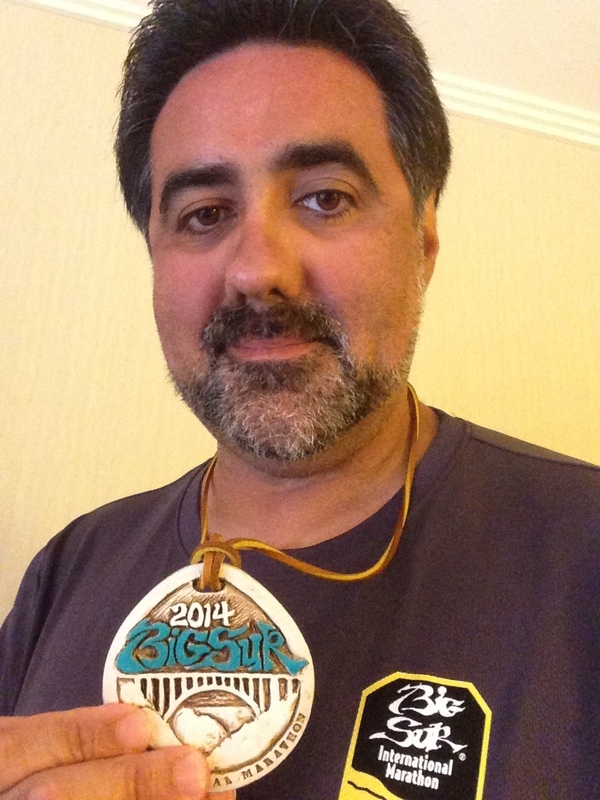 Six weeks prior, I couldn’t complete 4 miles and now there were 26.2 in front of me. This race could end very quickly for me. Before I knew it we were underway running through Redwoods. 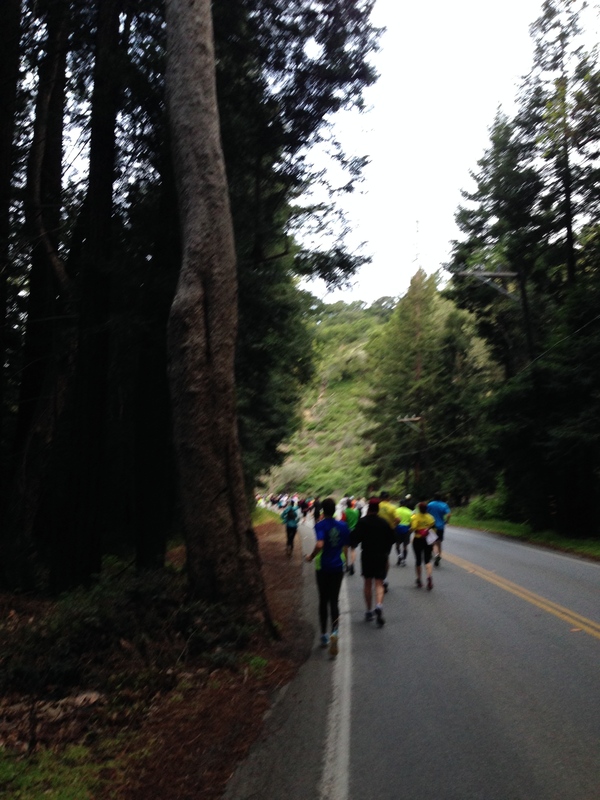 The Big Sur Marathon reminded of a trail race, not only because of the hills, but because of the immersion in nature. Through most of the race there was dirt strip off each side of the road. My wife describes the benefit of running on trail is that the earth absorbs the impact. Although it’s more work, running on dirt is much easier for me mentally than is running on asphalt. Marathon running is in fact, as mental much as it is physical, even more so when one is injured. The other way this race reminded me of a trail run was that there were no spectators for most of the course. Highway 1 was shut down while this race was underway making this the antithesis of the famed First Avenue of the New York Marathon. 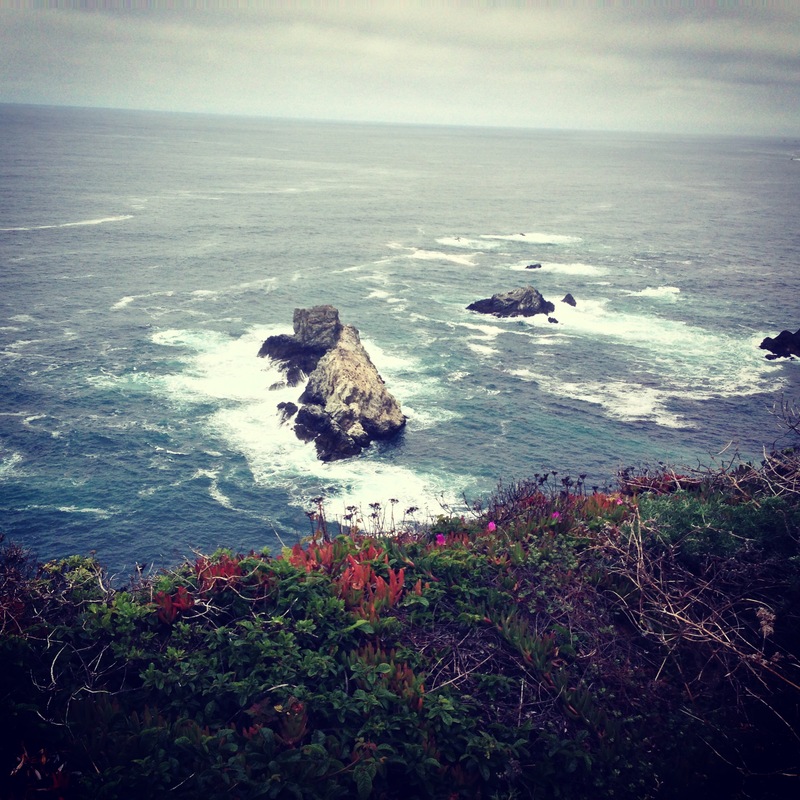 There were no spectators, no signs, no cowbells, no cheering, only runners, horses, cows, the ocean, the occasional bridge, breathtaking views and God. Lots and lots of God. At mile 4, I pulled over to slow down and walk a bit. My right calf quivered, spasmed momentarily and started barking at me like a crazed neighbor in a tenement, “HEY! I will seized up! Don’t slow down! MOVE! “; on the plus side, I had a really fast (for me) first 9 miles. The Mile 5 marker signified the end of the protection of the redwoods. Beyond the sign, the world changes from redwood forest to exposed Pacific coastline. On a bad day that could mean a miserable headwind. This was a good day with overcast skies, cool temperatures and no cows blowing by. 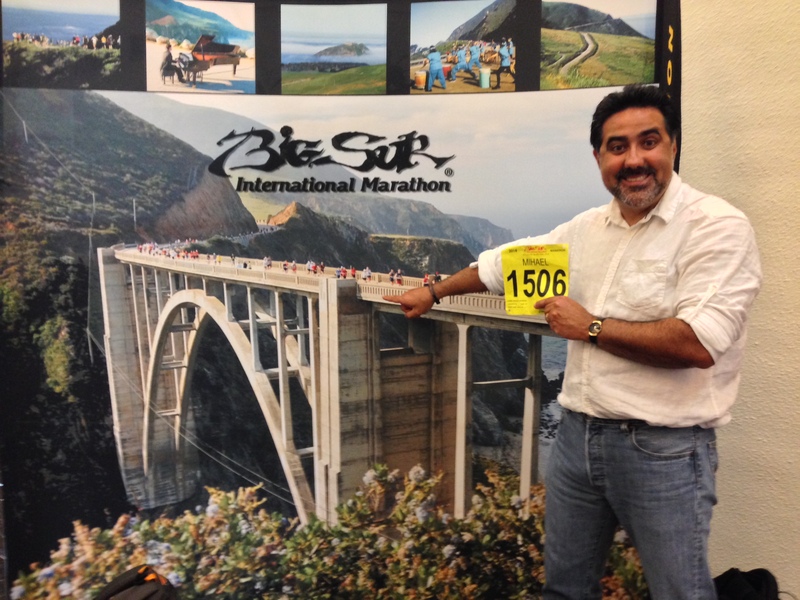 The Big Sur Marathon is accurately marketed as a race “on the Ragged Edge of the Western World”. 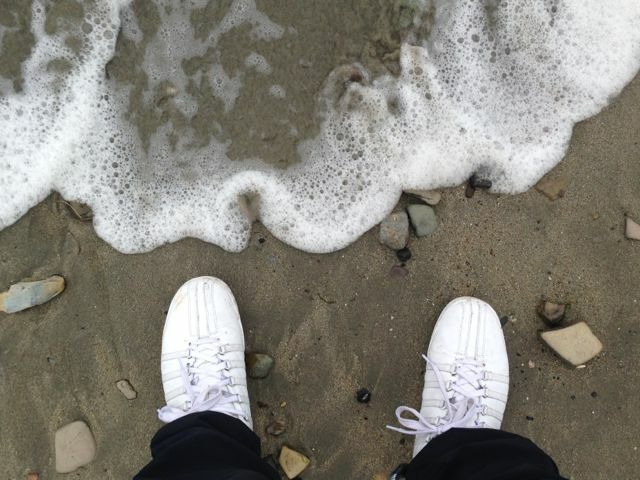 When the redwoods gave way to the sea, things shifted for me. 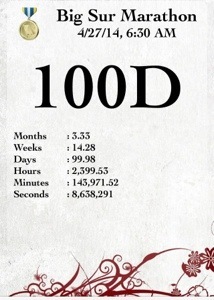 I was grateful to have made it that far. I started to feel like my old running self again. The worry passed and I started to enjoy myself. I started to believe there was a chance I could do this. My knee hurt a bit, my calf hurt a bit, but I was bee bopping along pretty well (bee bopping, that’s a highly technical runner term). I was moving in a crowded cohort of runners. There was an older Irish lady with a sign indicating she was running her 99th marathon. We kept passing each other as I was generally faster, but she was more consistent (think rabbit and the hare). There was also that young couple in the maroon Minnesota Golden Gopher shirts. Evey time I would come up behind them, I had to say “Go Gophers” in my best Minnesota accent. The very last time I saw them he was standing guard as she was taking a bathroom break behind a big bush. I couldn’t resist yelling out, “Going Gophers!”. He laughed. A GPS can tell you the distance you’ve traveled but looking back shows you the beauty of where you’ve been in a whole new way. This race is beautiful both forward and backward looking. You miss half the views if you don’t look back. Miles 5 to 10 went joyfully for me. Then came the 2 mile climb to Hurricane point at 15% grade (that’s serious). The memorable thing about that transition to the long hill was that the song Sweet Caroline came on my running music right at the start. I had asked one of my Scotland tweeps, Barbara to recommend a song to add to the playlist. Her contribution interrupted the usual order of my marathon music and I found myself singing Neil Diamond as I started my climb. I sounded like an idiot, at the Sweet Caroline crescendo, but I just didn’t care. I was taking the hill….until I wasn’t. The view when Sweet Caroline Came On. I ran as much as I could up that 2 mile hill and then I walked and then my calf tightened and then my knee tightened. Things turned ugly really quick. The next 3 miles took me 45 minutes to complete. I used this time to eat the nuts and chocolate I carried with me. I normally wait until later in the race, but I was moving so slowly that this seemed the perfect time. When I finally got over the hill, my leg was too tight to run and I had to walk down the hill. 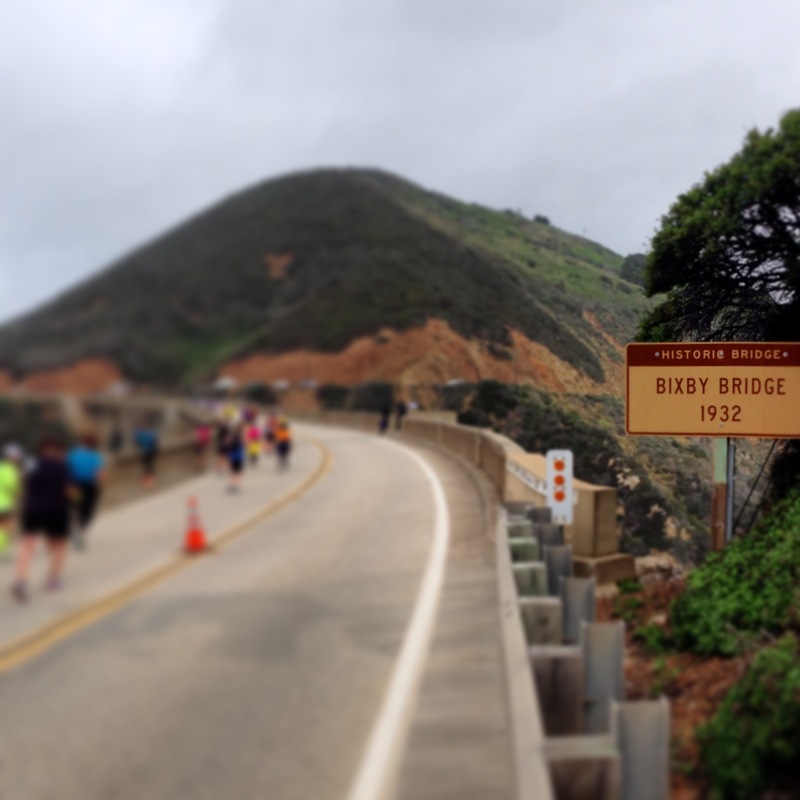 I was angry, but I had the Bixby bridge, half-way point in my sites and to me, that was like water in the desert. Most marathons have a sign that show you when you have reached the halfway point. 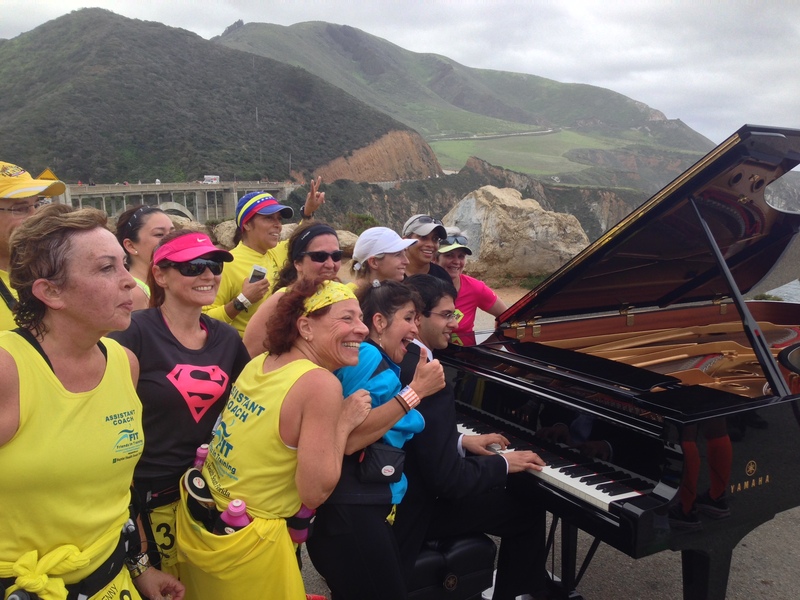 This race offers the unusual highlight of a serenade by Monterey’s own composer/pianist, Michael Martinez. Michael’s music marathon greets all the runners from first to last as they cross the bridge. He was playing Paul Simon as I approached the line for a picture with him. After I got my photo, I wanted to wait and listen and take the scene in. I struggled, because I was in the middle of a timed race and taking videos of the ocean with Michael playing in the background was not conducive to a personal best race time or in my case, finishing before the course closed. I make peace with the delay, but I wasn’t sure if I was going to finish this race, so I might as well enjoy this moment of my life. I wondered if the people in first and second place stopped to enjoy the music and take a picture. I wondered if they got any good selifies as they pushed each other along. Did they just zoom by the piano and did Michael play the William Tell Overture? Who knows? I am just glad that wasn’t my experience. I was just out for a long run, with a time limit. Next time though, I will ask him if he knows any Grateful Dead. 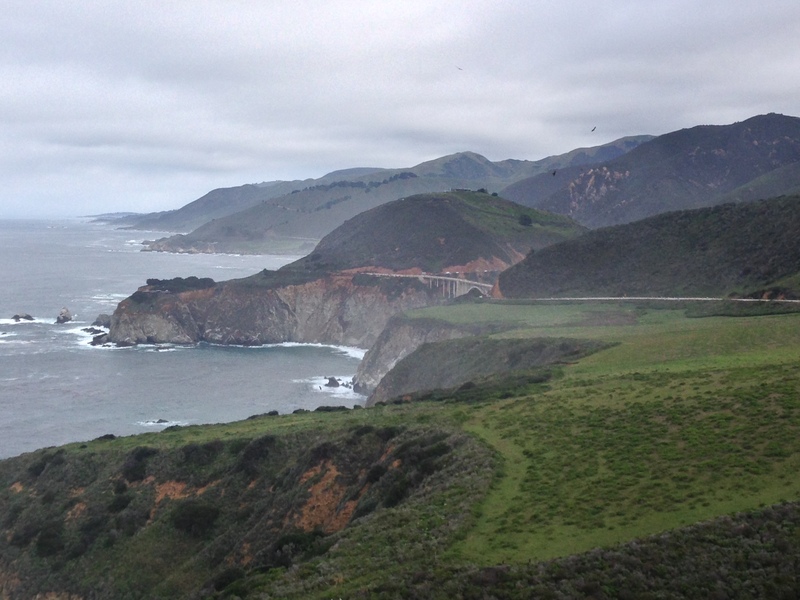 After the intermission on the Bixby bridge, I was moving slowly, but moving. It struck me that I had no idea what waited in store the rest of the race. I am a planner, I usually have my long races well scouted and researched. Not this time. I had been so focused on getting to the half-way point, that I didn’t have a plan for the rest of the race and the rest of the race was all hill after hill after hill after hill after hill. I withdrew deep into myself and kept going. For the rest of the race, I only interacted with runners I saw needing of encouragement. As I ran I thought. I realized that all four of the marathons I had participated all touched the Pacific Ocean, none so much as this one. I had set my GPS to display only distance and total pace. I didn’t want to be distracted by the time, but I needed to be aware of my pacing in order to stay ahead of the course closures. About Mile 17, my head started doing the math and I realized that had enough time banked that I could walk at a 18 minute/mile pace for the next 9 miles and still finish before the race closed. I didn’t like entertaining this idea, because it gave me an excuse not to try my very best. That being said, I was having trouble maintaining any kind of sustained run either up or down the small hills. By mile 19, I redid the math and gave in and started power walking/limping the rest of the race. Walking went against what I believed I should be doing, but I was just going to frustrate myself trying to continue running, as had no kick left. 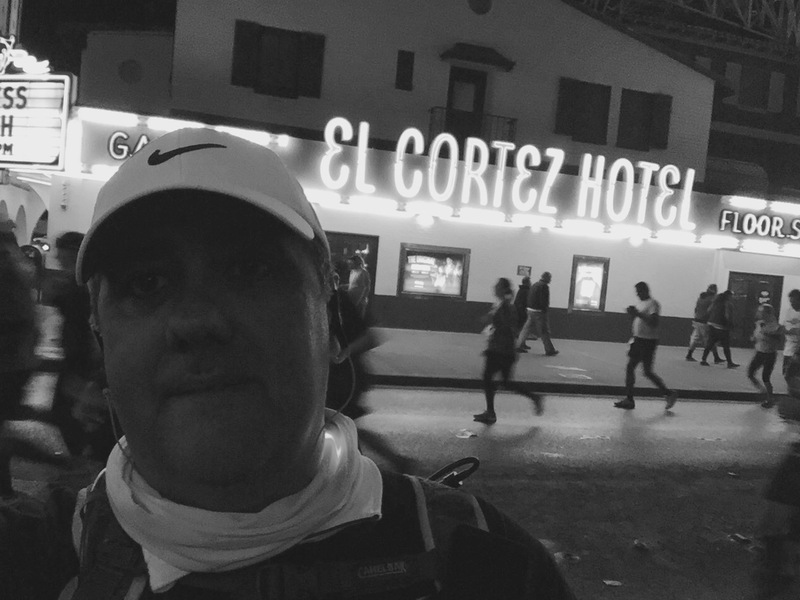 Eventually, I settled on the idea that as long as I finished, walking the rest of the marathon was just an alternative way to succeed. Acceptance was the answer to all my problems at that moment. About mile 21, I came across a scene. Paramedics were working on the side of the road on someone. The runners were diverted to a narrow single lane and our view of what was going on was blocked. A blocked view is never a good thing; I’ve been around enough races to know that this was out of the ordinary and I’ve been in enough Emergency Rooms to recognize that blessing and a prayer was in order. As it turns out, though a nurse and doctor were immediately on scene one of the volunteer race marshals collapsed and died at that spot. 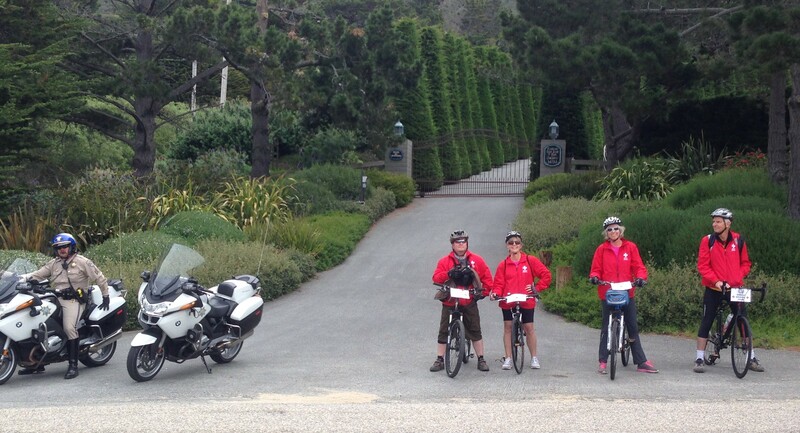 I had heard about the strawberries on the Big Sur Marathon. I had heard that they were fresh and delicious. Given that I have strawberry fields around my home, I didn’t take much note of it. I had passed on the orange stations during the LA Marathon in observance of the rule that one should never eat on a marathon what one hasn’t eaten during training. As I was at mile 23 and they were there, I indulged and I am so very happy I did. These were great strawberries. The flavor exploded in mouth. I wanted to only have two and I ended up finishing a good half-dozen before leaving the station. It was a highlight. I crossed the finish line in a marathon personal worst 6 hours and 3 minutes. To be fair, this was the hardest of the four marathons that I have run, San Francisco included. I also started in the worst shape of any marathon with no training runs exceeding 15 miles and virtually no running in the final weeks. I was happy to have found a way to finish. I was tired, limping and I had strained my abdominal muscles and a quad muscle power walking, but I finished. In truth I was disappointed, not so much in the performance, but in the shape my body started the race in. The course officially closed about 15 minutes after I finished. I sat, stretched, ate and called as the volunteers began to take down the tents. The show was definitely over. I made my way out to the shuttle bus area and waited in a small group. A lady recognized me from the race and jokingly commented to the small group how at the start of the race I was chatty and happy and at the end of the race I was laser focused and dead serious. I smiled and in my mind, thanked her for the feedback. There were only two of us on the full length bus back to my hotel. The bus driver was released for the day now that we the stragglers were done. I showered, soaked my legs in the cold pool, and went for lunch. I hung out in the hotel the rest of the day because I had another early wakeup call the next day. The travel home was another full adventure. Although I deeply enjoyed the experience, I spent about six months being disappointed in my performance at this race hearing those words again, “You don’t look like a runner. THEY look like runners“. This past week I finally decided to check out my certificate of completion. I finished 222nd out of 433 people in my age division. That’s a whole lot better than I would have guessed (I suspect they count those that did not finish). Overall, I finished in the bottom 26% of the race participants, that was better than the bottom 3% I would have thought. I guess to be a marathon runner, stubbornness will suffice in lieu of faith. It also helps if one sanity checks with the actual statistics. The picture above was taken on 9-November, 2013. 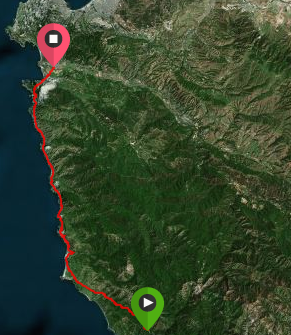 It was the low point of that year, I was driving myself home after barely completing the Santa Barbara Marathon. I injured my knee during that race and was making the 2 1/2 hour drive. Pain radiated from my knee every time I pressed the accelerator, I was positive that I needed surgery and trying to accept the fact that my running days might be over. As the exits zoomed by I felt the need to pull off the freeway at Seacliff road in Ventura. The view along the freeway was breathtaking and I wanted to take a break before running into the Saturday night LA traffic. Seacliff Road was completely unremarkable, but after a few turns I pulled right up to the beach. My knee could not support my weight so I took the picture from the car as I sat listening to the ocean. I had a moment there, a quiet, simple and peaceful and yet tormented moment. Yesterday, on the way home from vacation, with my wife and daughter in the car, I traveled that same freeway and I pulled off along that same road. This time I parked the car and climbed down the rocks with micro-twinges of that November injury reminding me to take it easy. 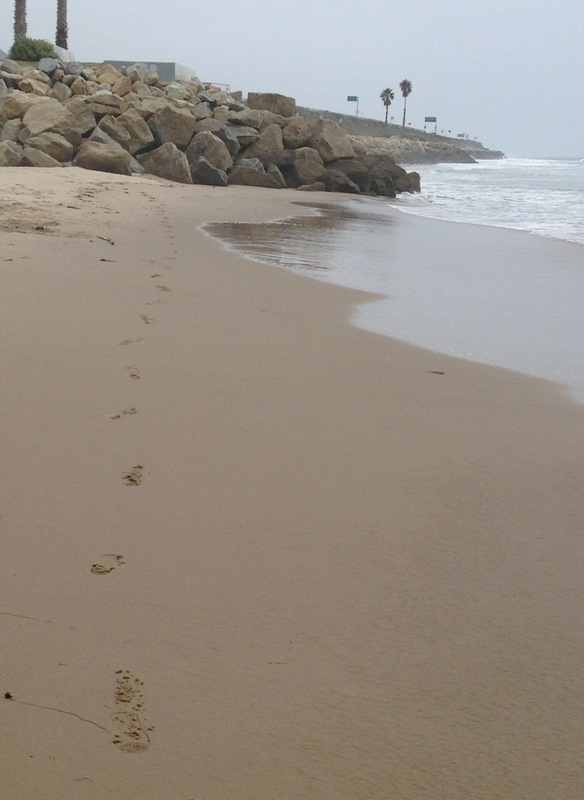 When I hit the beach, I had the overwhelming desire to run. I broke out into a full sprint down the sand. It felt good physically, emotionally and spiritually. A mentor of mine once pointed out that people either tend to move toward pleasure or away from pain. I am about a week out from my next marathon. I am not in the best physical condition. I am having calf problems and it would be easy to just take a pass on this next race and walk away from the sunk costs of the race registration and the airfare. Here’s the problem: I would rather fail because of the injury than not show up because of the fear of the pain or the desire to avoid the expense of the hotel room. I go back to that moment at the start of the Edinburgh Half Marathon when I decided to run in my leather dress shoes, because I knew the blisters would heal, but the regrets would last forever. Whether that is stupid, pig-headed or God-willing, something perhaps more noble, I have come to the conclusion that’s what I do and that is who I am. Sanding on the Edge of the Shore. I entered the lottery on December 1. I woke up today looking for that certain email. I got my answer a few minutes ago. I admit to feeling a little numb and disappointed. Given that I am rehabbing a knee/hamstring injury just 30+ days before my next marathon, I half-expected the universe to have a sense of humor and to put me into the NY Marathon so I would start training again in July. In truth, I am glad not to get in and to see in the near future an opportunity for an extended break from long-distance running. The way my body has responded the past year, I don’t think my body has many marathon training cycles left. It’s not so much the marathons that are the problem, it’s the mandatory training miles and having to ignore aches and pains as well as all the cross-training and the associated opportunity costs. There are no unmixed blessings or curses. Not making it in to the marathon makes it easier for me to take my family to New York to see Derek Jeter’s final games in Yankee Stadium. Such problems a person should have, no? I have friends with children in the hospital. If this is the worst thing that happens to me this year, I am a lucky man. Good luck to those who made it into the NY Marathon for 2014. I wish you all enjoyment and fun. I promise to get up early that day and cheer you on. For those who have real problems in this life, I send you well wishes. For now, I am going to go and not run, take ibuprofen until I am full, fiercely foam role my IT bands and watch the sun go down. 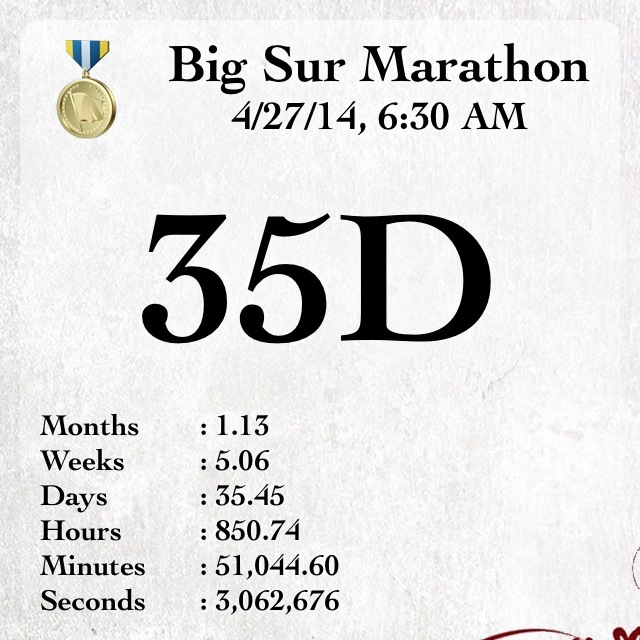 It’s exactly 5 weeks until the Big Sur Marathon. Yesterday, I finally got it through my thick skull that I am hurt. I went out for what should have been 15-16 mile run yesterday, but I had to turn home after 4 miles. The run started off like all runs have this training cycle with about 1/3 of a mile of tightness in my right knee. I was definitely running on tired legs, which is normal for this late in the cycle. About mile three I started to hobble and I noticed that my right foot was toeing (pointing) out, such that I was landing on it at a 45 degree angle. This was due to the lateral muscles of my right leg being tight. I tried massaging my thigh but the problem remained. I stretched and walked, but the problem remained. My mind flashed back to those people at mile 23 of the San Francisco Marathon who were clearly hurting and it didn’t seem they would be able to go on. 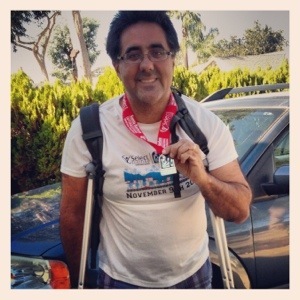 I tried forcing my foot to land straight ahead, but that just strained my knee in a manner that was reminiscent of what I felt at the Santa Barbara Marathon. I started to feel fatigue in my left thigh as it was overcompensating for the right leg. So I shut the whole run down. At home I had a realization that even though I knew my right leg was the one hurting, I rolled my left side and then pretty much stopped. This I believe is part of my problem. I have been favoring my dominant leg when it comes to stretching and rolling. I guess it is better to figure this out now than in 35 days, but it’s frustrating and a bit scary. I really don’t want to have a repeat of what happened either today or at Santa Barbara. So now the challenge becomes how to train and let my knee heal up again. I am guessing that is going to involve lots of bike riding, stretching and rolling twice a day and making peace with my reluctance to take Ibuprofen. I remember when training for races was easy. 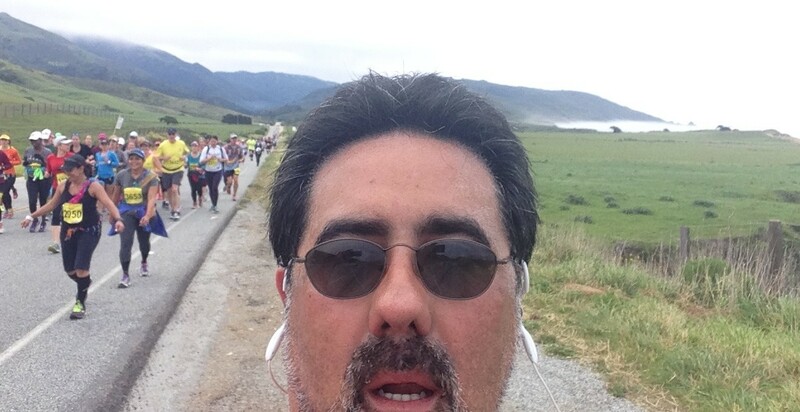 I took part in the Santa Barbara Marathon yesterday. More will be written about the wonderful and challenging day later. The good news is that my left calf, which has curtailed my running and tennis for the past few months, came through with no problems at all. The bad news is that my right knee, the good one, can’t bear any weight. 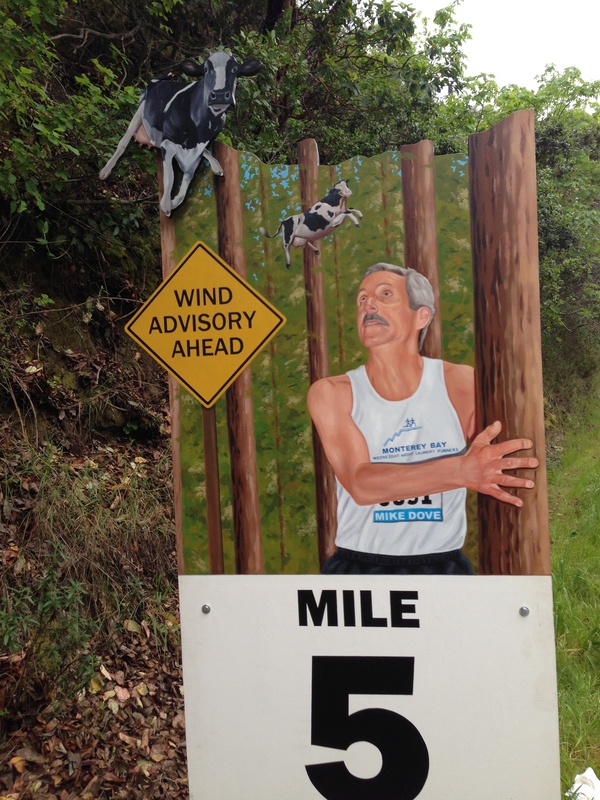 Something felt odd in my knee about Mile 4. By mile 14, I was clearly on pace to beat my San Francisco Marathon time, though I was uncomfortable running on any uneven surfaces. Mile 23 was all uphill and I decided to take that one slow to refuel for the last miles. 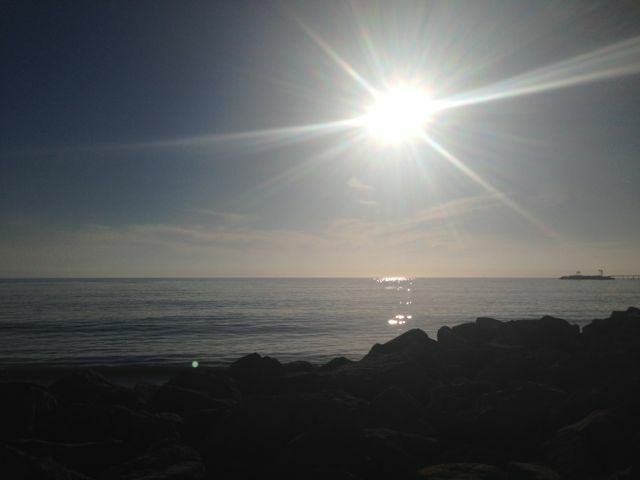 When I started to run again, I knew I had a problem that was not going to be massaged away. I ran to finish line, but once I stopped running, I began to hobble. 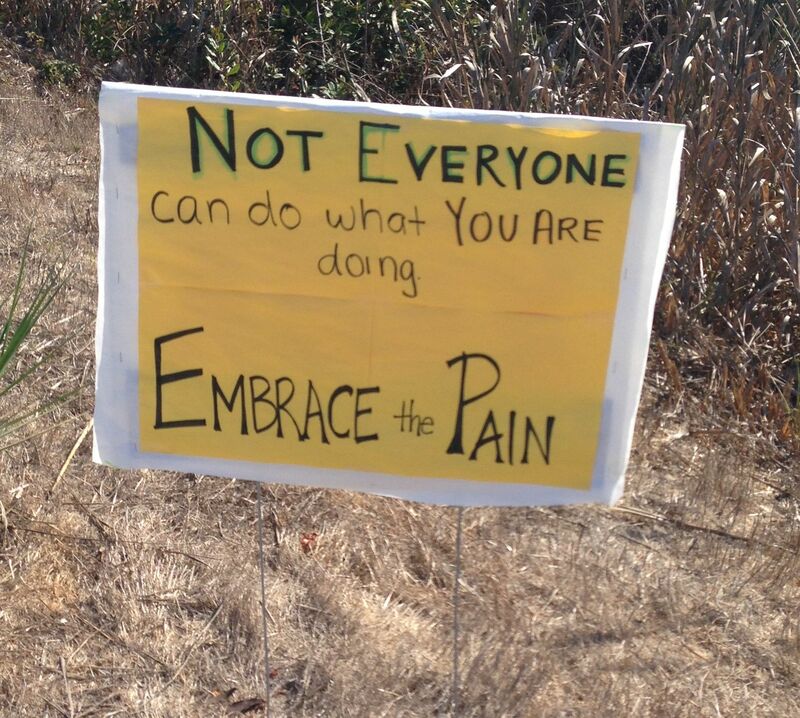 Sign on the hill from Mile 23. God was looking out for me though as evidenced by 1) the bag of ice on the floor where I sat down on the bus and 2) my ability to put all my weight on my left leg. Even last week there were still very minor twinges in that problem calf. The last blessing was that I wasn’t starving nor did the rest of my body feel the effects of the 26.2 mile run. This next morning, my legs aren’t feeling the normal effects of the race. So Monday I need to get into a orthopod. Until then I will be crawling on all fours around the house. The good thing is that the knee doesn’t hurt, it just can’t bear weight.